Weddings are such a joyous time. We are so lucky to be a part of the happiest day of people's lives, and this image captures that perfectly. This exquisite wedding party of bridesmaids in a smokey dark blue floor length dresses and groomsmen in grey suits with pick ties and really having fun. Everyone grabbed a handful of pink and white rose petals, courtesy of Sandy at Fiddlehead Designs--who also provided the stunning bouquets, and at the count of three they all threw fistfuls of petals into the air. The petals floated down like snow flakes around the group, showering them all. And my very favorite part of this image is the little flower girl, donning a baby's breath flower crown, is smiling and busting with so much excitement that she closes her eyes and clasps her hands tightly by her cheeks. And can you image a more picturesque setting for a wedding. 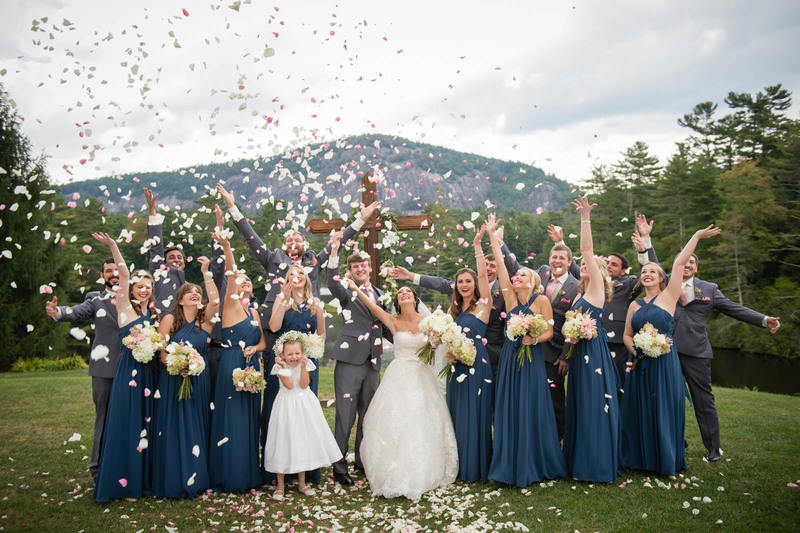 Elizabeth and Rowdy were married at High Hampton Inn in Cashiers, NC. A resort nestled in the Blue Ridge Mountains, about an hour and a half drive west of Asheville. The rustic resort's main inn and private cabins are situated around a private lake edged by a rock faced mountain in the background. Shortly after this image was taken, we all walked to the reception across the property to the pavilion to dance the night away with Steel Toe Stilettos.